My name is Mihaela Varzari one of the 4 international curators and researchers in residence selected as a result of the open call launched in 2016 by MNAC (National Museum for Contemporary Art), Bucharest, Romania under your directorship. I was looking forward to carrying out my project in Bucharest when 2 weeks prior to the starting date I was informed (in a 2 line email) that my residency was cancelled because of the budget. My many attempts to discuss alternatives with you didn’t get anywhere as you never endeavored to respond to any of my emails, letters or phone calls. I even met you face to face, by sheer coincidence, at an art opening, but you told me you were too busy to discuss my situation. Only once someone from MNAC called to let me know that it was not a cancellation but a rescheduling. Nothing was followed up, despite a number of emails I sent in the hope of getting the ball rolling. I can’t help but think now that the promise of re-scheduling my residency was a tactical way of evading the problem altogether in the hope that I would eventually lose interest in pursuing this opportunity. My reaction to this cancellation and the treatment on behalf of yourself and your staff was one of immediate shock and disbelieve. A publicly funded institution decides on a whim to discriminate against 1 of 4 residents (the other 3 residents carried out their respective projects) without feeling it at all necessary to offer more than a 2 line explanation and what transpired to be a false promise. In preparation for my time in Bucharest I had organized to sublet my room. As a result of the cancellation I had nowhere to live for a month and was forced to stay at friends and pay for a room with airbnb. The initial explanation was in relation to the budget but recently I just noticed that a new open call was launched my MNAC which indicates the opposite. - What avenues are there at my disposal for interrogating such unprofessional attitudes verging on abuse of power? - Does MNAC have any responsibility to explain itself, especially since it’s a public institution when asked to? - What kind of legal format does such a relationship between an invited resident and such institution can take? - What about the social contract or just basic human decency? P.S. If any of you are lawyers, please offer me some advise. Please feel free to share on FB, it would be great if this letter actually reaches them. 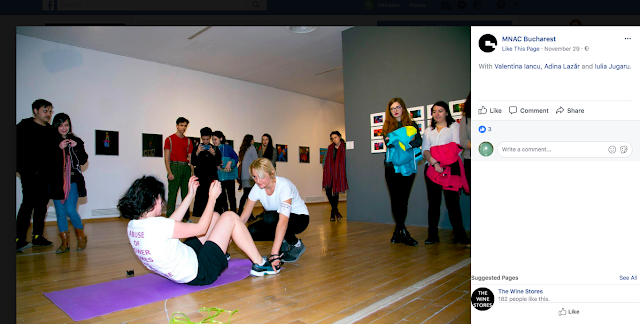 Mihaela Varzari, the National Museum of Contemporary Art is consternated with the public stance you are undertaking regarding this issue, which only partially reflects the situation. As with all our residents, we were keen to have you as part of our team in 2017. Our team - the Director of Development, the Residency Program Coordinator, the Residency Program Caretaker and the Management Assistants had numerous conversations with you in order to make your residency happen. Despite extended negotiations, we could not reach a consensus on practical matters regarding housing, transport and the residency period - all necessary conditions required to draw a contract. During this laborious and unfruitful process, unexpected budgetary constraints forced the Museum to reduce the scale of the residency project. Since such issues were not raised by the other three residents, their contracts were signed in due time so that their projects could be carried out accordingly. In conclusion, having failed to reach a consensus over a long period of time, the museum was forced to suspend your residency, in the context of unexpected cuts in our operational budgets. This was not an issue of discrimination, but the sole consequence of an agreement not being met at the administrative, legal and financial levels. Additionally, it is common knowledge that in Romania there are no multi-annual budgets, which means that state institutions cannot finance projects from a year to another. Thus, the 2018 residency project call relies on an estimated budget for the following year. this is a false and exaggerated version of events and it shows the unnamed author’s lack of assuming any responsibility or engaging with reality. Please do your fact checking first and stop this charade right here and now. I have emails to prove the opposite. You are masking your patronizing attitude by trying to place the blame on me. 1. MNAC curtailed my residency from 6 to 4 months because of weather conditions. No other explanation was offered. Did the same happen to other residents? My emails with the staff member show that we were in agreement on the residency period (1 of May – 30 of Sep, four months in Bucharest, one in London). 2. I was in touch with the same staff member about the accommodation conditions etc and we were looking for such options in Bucharest. No one at any point told me anything about the negotiations going sour. There were not extended and at no point I was under the impression I was doing anything wrong, as you suggest. Such email exchanges were not laborious or fruitless but the type of conversation which is practical and absolutely mundane. 3. Transport? Perhaps you mean the flight ticket? My conversations with the staff member reached the point where I gave my details for the flight ticket to be bought and then nothing happened. Disclaimer: Iancu wears an armband with the words ‘Mihaela Varzari etc’ sewed with lilac thread on white cloth in solidarity with Varzari’s public open letter addressed to Călin Dan (director of the National Museum of Contemporary Art, Bucharest, Romania). Etc stands for the multiple cases of abuse of power and autocratic behavior of the director demonstrated in his relationship to ex-employees or collaborators of the museum.